Trending Topics – Wind and solar are our cheapest electricity generation sources. Now what do we do? A version of this article was originally published on January 26th, 2017 on Greentech Media. For years, many debates on the future of the electricity system centered on getting the balance right between higher costs and lower environmental impacts. But the economics of the renewable energy transition are rapidly shifting. 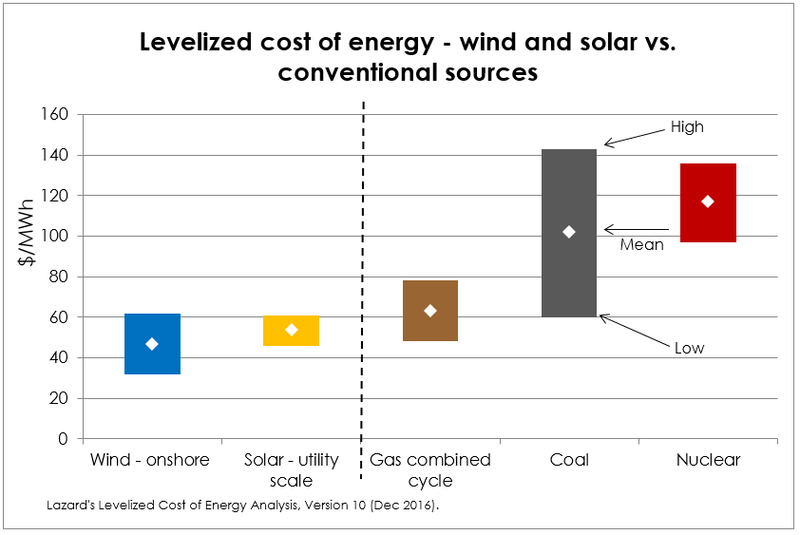 In financial advisory and asset management firm Lazard’s 10th annual report on the levelized cost of energy (LCOE) for different electricity-generating technologies, renewables are now the cheapest available sources of electricity (other than efficiency) even without subsidies, a trend confirmed by similar analyses of wind and solar costs from Lawrence Berkeley National Laboratory. With subsidies, in some places new wind is even cheaper than the short-term marginal costs of existing fossil-fueled plants, raising new questions about whether these plants should be retired early. It’s looking like we may not have to choose between affordability and environmental impact – a cleaner, cheaper grid may be within reach. Lazard’s analysis flips the question of clean versus cost on its head, and for many parts of the country in 2017, we’ll be asking how much can we save by accelerating the renewable energy transition? Lazard uses LCOE analysis to identify how much each unit of electricity (measured in megawatt-hours, or MWh) costs to generate over the lifetime of power plants. LCOE represents every cost component – capital and financing expenditures to build, operations & maintenance, and fuel costs to run – spread out over the total megawatt-hours generated during the power plant’s lifetime. Because different plants have different operating characteristics and cost components, LCOE allows us to fairly compare different technologies. Think of it as being able to evenly compare apples to oranges. Lazard’s cost estimates are consonant with reported prices of contracts for wind, with several wind contracts in the low $20s and high $10s. However, these numbers don’t tell the whole story. 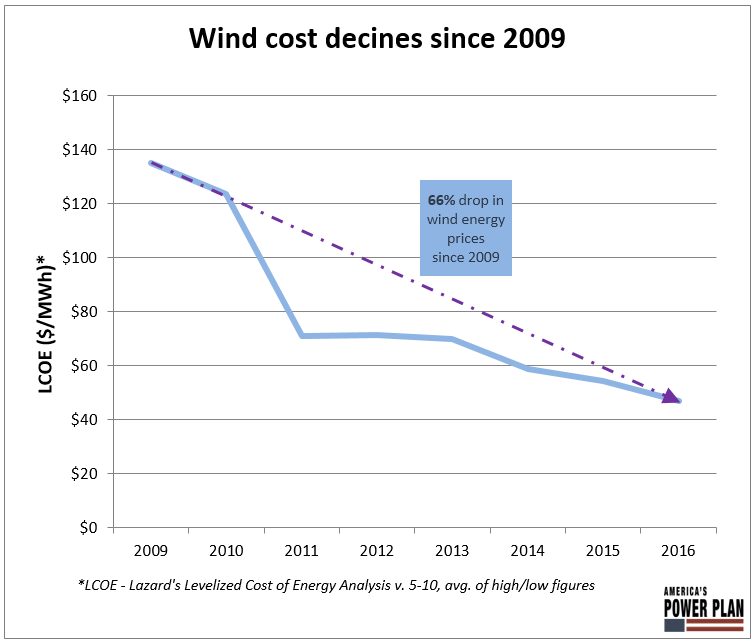 Though wind power is the cheapest it’s ever been, wind costs were well below their 2009 peak in the early-to-mid 2000s, mostly due to low labor and commodity prices. Wind costs also vary widely depending on regional wind resources – from the low $30s in the Great Plains and Texas to the mid-60s in California and the Northeast, and have small integration costs in the range of $2-7/MWh. Lazard’s solar costs are confirmed in a compilation of 2014-2015 solar prices by Lawrence Berkeley National Lab, with several contracts coming in well below $40/MWh, taking advantage of the 30 percent investment tax credit. Like wind, sunlight availability varies by region. For example, very little solar gets built in the Northeast where the same solar plant only generates 68 percent of what it would generate in the Southwest and California at similar cost. 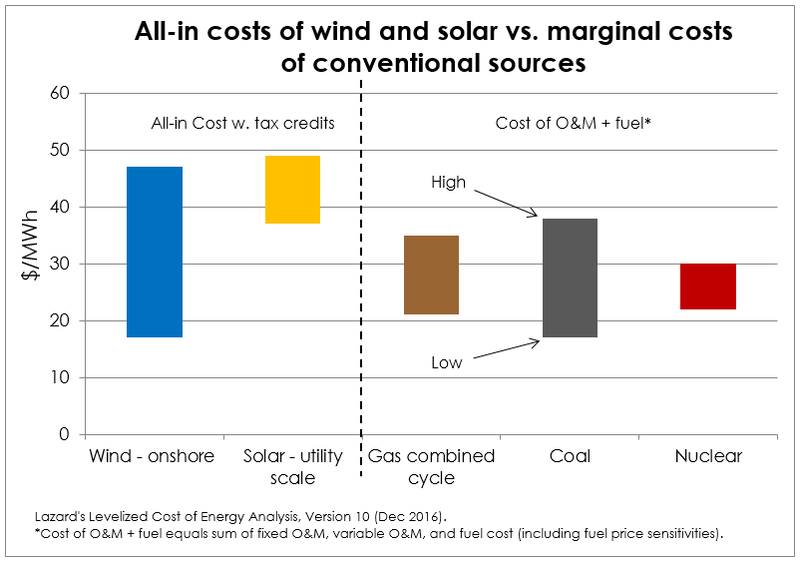 The case for wind and solar as the grid’s cheapest resources becomes even clearer when federal subsidies are considered: Tax credits drive renewable energy’s costs down to $17-47/MWh for wind and $37-49/MWh for solar. This precipitous drop in wind and solar prices means utilities and their regulators need to keep up on the latest numbers, or else they’ll be driving blind when deciding investments in new infrastructure and whether existing plants should be retired. How can this impact overall system costs? Like any generation technology, wind and solar impact the dynamics of the whole system, including what resources and infrastructure are needed as complements. But claims about the integration costs of variable resources like wind and solar are often overstated. A recent study from the National Oceanic and Atmospheric Administration (NOAA) used high-quality, granular hourly weather data to find complementary wind and solar resources and considered what would happen if they were linked with a national high voltage direct current (HVDC) transmission backbone. They found that 80 percent zero-carbon generation, including over 50 percent wind and solar, could provide reliable service at lower cost than today’s power mix without increasing hydro or battery storage capacity. It turns out Lazard’s cost numbers already approach the lowest cost assumptions from the NOAA study, meaning NOAA’s most generous assumptions about cost declines by 2030 are nearly a reality in 2017. For example, in its “low renewable high gas cost” scenario, NOAA used $1.19/watt for solar’s capital plus O&M costs. In Lazard’s recent report, solar capital plus O&M costs have already fallen to $1.44-$1.59 in 2016. This highlights the need for models and the policymakers that use them to ensure cost data is up to date. Failure to do so could lock in hundreds of billions of investment in uneconomic natural gas infrastructure. The costs of integrating high shares of wind and solar become much higher without the HVDC backbone, as resource-poor regions can’t access the windiest and sunniest (and thus cheapest) places to generate wind and solar power. Costly, drawn-out processes for siting transmission and power plants and allocating costs of multi-state transmission lines further drive up project costs and stifle investment. Policymakers can turn to America’s Power Plan for recommendations on streamlining the siting process and limit local impacts to create policy that reduces siting costs for renewables in the U.S.
How should policymakers and utilities use these new numbers? Even with these new numbers, more natural gas plants are being built every week, expensive coal is not retiring as fast as economics would dictate, and the transition to renewable energy isn’t happening fast enough to prevent the worst effects of climate change. Two misconceptions limit renewable energy deployment even in the face of wind and solar’s drastic cost declines: 1) misguided alarmism about the reliability of renewables, and 2) misconceptions of the cost of running the grid with more renewables. Managing America’s grid with variable renewables also requires rethinking how we operate and plan our electricity systems to provide reliable service, and many utilities and wholesale markets have been slow to adapt. Grid operators sometimes claim we need to back up solar and wind an equal ratio of thermal generators or storage for “when the sun doesn’t shine and the wind doesn’t blow”, but the NOAA study shows additional transmission and better regional coordination can do it much cheaper. 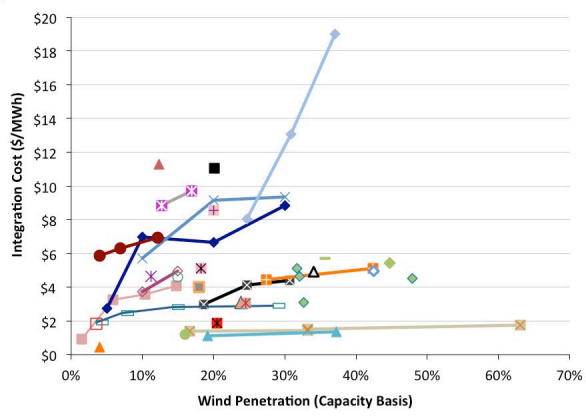 National Renewable Energy Laboratory (NREL) analysis corroborates NOAA’s findings – showing we could quadruple the amount of wind and solar on the grid today without reliability issues. This variation in integration cost studies reflects the difficulty of attributing integration costs to any one technology across a big grid, where a diverse mix of power generation linked by robust transmission naturally smooths variability – much like an index fund versus a single volatile stock, for example. Conventional thermal generation like gas, coal, and nuclear power also require new transmission, fuel supply and storage, and large backup reserves. These can also be counted as “integration costs,” even without accounting for the health and climate costs of carbon dioxide and other pollution, which can exceed $25/MWh for natural gas, and $60/MWh for coal. Transitioning our electricity sector away from fossil fuels is no longer just an environmental imperative, it’s an economic one. Free markets now favor solar and wind—look no further than gas-rich Texas for evidence. Texas has more than three times more wind capacity than any other state, and solar is expected to grow 400 percent by 2022. 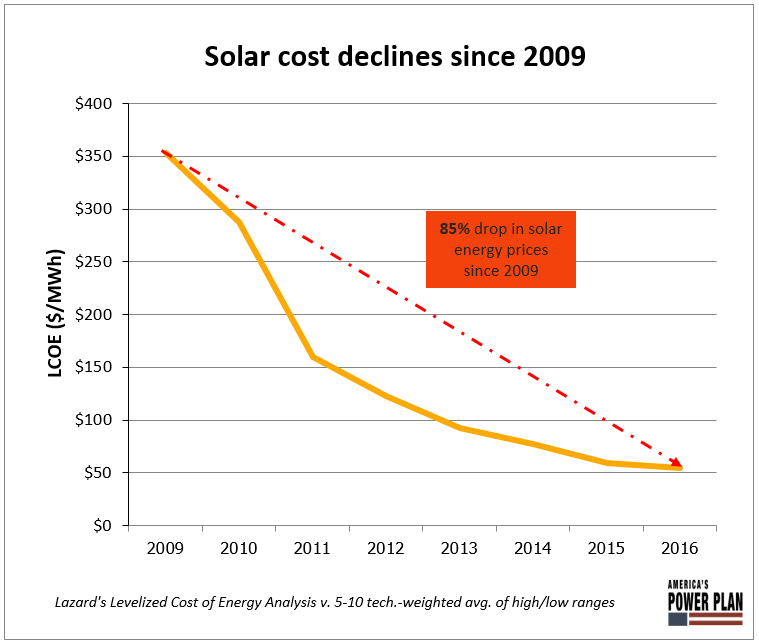 Outdated policies leave us unprepared to take full advantage of the rapid cost declines we’re seeing in the wind and solar industry. Failure to adapt to rapidly changing cost numbers will result in uneconomic investments that lock in emissions. The time has come to adopt a paradigm where wind and solar form the backbone of our electricity grid. Subscribe to our America’s Power Plan email newsletter to have the latest Trending Topics from Energy Innovation delivered to your inbox.